A+ Math and Science Tutoring was started by Sean Klein to continue his life goal of helping students of all ages improve their education in Math and Science. 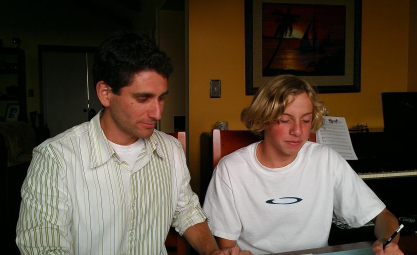 Sean Klein has been tutoring since 1997, and has been joined by other talented teachers who look to providing the highest quality education in the comfort of your own home. All teachers/tutors at A+ Math and Science Tutors and both College graduates and have backgrounds in Math and Science, with a commitment to helping your son or daughter succeed in their studies. Tutoring is about subscribing to the same philosophy of learning excellence; and our teachers are experienced and go through a rigorous screening process before joining our team. We offer tutoring San Fernando Valley and Ventura area, by bringing teachers directly in the home at the times most convenient for you. Creating an environment that is already familiar to the student, reduces stress, giving the student a comfortable learning environment. We make sure distractions are removed. Individualized attention ensures that your child remains engaged. A+ Math and Science Tutoring focuses on building confidence, motivation, focus, and problem solving skills. In addition to building skills, our teachers are very capable in providing assistance with homework, school projects and test preparation. Our teachers are warm and continuosly engaged with students to make sure that they’re on the right track. Achieving success in the classroom! Contact A+ Tutoring to schedule a time that works for you and your son or daughter. Ventura County: Ventura, Oxnard, Camarillo, Newbury Park, Thousand Oaks, Oak Park, Moorpark, Simi Valley. Los Angeles County: Westlake, Agoura Hills, Calabasas, West Hills, Woodland Hills, Tarzana, Encino, Northridge, Sherman Oaks, Bel Air, Studio City, North Hollywood.